Ankle joint pain comes from a complex organ causing a lot of misery. They articulate with each other and with two leg bones; the tibia and the fibula, and the forefoot. 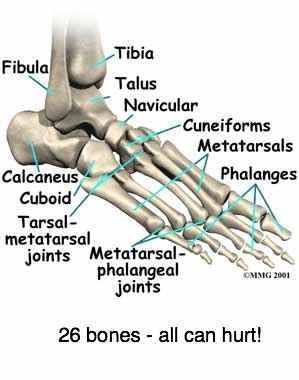 In total there are 33 joints in each foot, and what's more the feet have to work in harmony with each other. It's complex. Feet can hurt, believe you me. It's no coincidence that the Japanese would choose the feet when they wanted to know all your secrets. It really is complex. The cuboid alone, for example, articulates with six other ankle bones. So many joints to injure, and that's just on one side of the foot. Ankle joint pain is usually the result of an old sprain or stubbing the toes against a cupboard. This is the joint that causes needle-sharp ankle pain when you try to walk on a sprained ankle. The subluxated talus is probably the easiest joint for your chiropractor to reduce after you have injured your ankle. It's basic Chiropractic ankle sprain treatment. 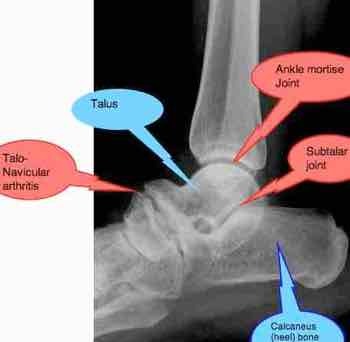 This complex known generally as the subtalar joint too may be subluxated in the ordinary inversion ankle sprain. If it's not reduced after injury, it often causes foot pain in the future. Actually, it's really three joints, in itself. 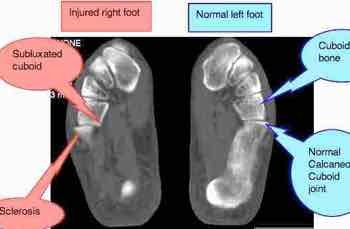 I treat the consequences of an unreduced subtalar joint every day; people with miserable foot pain. That subluxation changes their gait causing problems, not only in the ankle, but up the kinetic chain; in the knee, hip, the sacroiliac joint and, yes, probably all the way to the atlas in the neck. Don't underestimate the damage a limp can do to the rest of your body; that could also be from a subluxated bone in the ankle, a botched knee replacement or an arthritic hip, for example; or even an attack of gout that doesn't resolve. Both diabetes and a slipped disc affecting the femoral nerve can affect the quadriceps muscle causing a profound limp. Or a recent ankle joint sprain that makes the lower leg swell and become stiff. Worse, research reveals that anything that affects the speed at which you can walk has a direct influence on how long you will live. Deal with that ankle joint pain. ie. with six other bones. It's often affected for example if you kick a chair or cupboard with the little or 4th toe. That drives the metatarsals forcibly up against the cuboid. Just like any other joint, if a fixated joint is not reduced, it will lead inexorably to Immobilisation Arthritis. Within these so-called synovial joints there is fluid sloshing about carrying vital nutrients to the hyaline cartilage that lines the bones. You can see the arthritis very clearly in the CT above in the talo-navicular joint. Immobilisation arthritis is what happens to fixated joints that are not reduced after injury. This is not intended to be an exhaustive treatise on chiropractic help for ankle joint pain. Any one of the ankle joints can be injured in skiing, football, skating, just an ordinary slip and fall on the street. Each needs to be carefully examined and evaluated to prevent the onset of foot pain and chronic arthritis in the ankle. Often the services of other health professionals will be needed. Severe fractures can occur on and off the sports-field. But, once the surgeon has finished his/her work, and the bones have healed, get your ankle to your chiropractor, otherwise severe immobilisation arthritis is likely. Ankle and foot PAIN with a capital P.
Every chiropractor has his/her favourite techniques. The technique is not important - getting the subluxations in your foot reduced after injury is what is important. 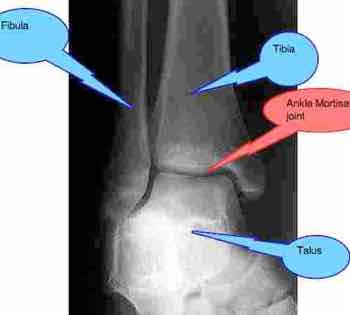 There are probably very few chiropractors qualified to treat an ankle fracture, but once that cast comes off reduction of any other concomitant subluxations (such as in the subtalar joint), and rehab of the soft tissues to prevent "functional instability". How reliable are X-rays? A missed fracture can cause avascular necrosis and a lifetime of ankle joint pain. Whether you love to shop, or simply hate it, take your time when buying running shoes. If you buy a shirt that ultimately doesn't suit you, it won't actually affect your health. But BUYING RUNNING SHOES can have a direct bearing on your health; ankle joint pain lurks. So, take your time, or... stay at home! Quite apart from foot pain, you could well have a SPRAINED ANKLE to contend with, and ANKLE SPRAIN TREATMENT doesn't come cheap. 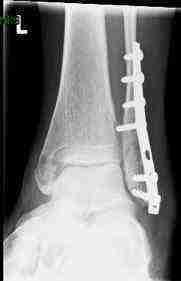 Not if the subluxated cuboid, calcaneus or talus has to be reduced and the whole ankle rehabilitated. Lots of pain too, rather spend the time buying shoes that fit you properly. Whilst not powerful like drugs, olive oil, omega-3 fatty acids, ginger and tumeric all are natural anti-inflammatory agents; they are important if you are battling with ankle joint pain. Short term, you may decide to ignore the dangerous side effects of anti inflammatory drugs and take them, but if you are thinking of a longer effect, then it's not unrealistic to add olive oil benefits to your salad or purchase yourself a small coffee grinder and sprinkle a tablespoon of freshly ground flax seed nutrition information onto your cereal every morning. It's virtually tasteless and inexpensive. Fish oil softgels (1000mg) are also an excellent natural anti inflammatory agent; better still enjoy salmon or mackerel regularly. So too that family of foods known as chenopods, for example swiss chard nutrition. Make sure you are eating these sorts of foods daily if you are suffering from chronic pain; do it anyway as prevention. Ankle joint pain and obesity go foot in foot! Refined carbohydrates are the villain of the piece but putting certain foods into your diet is easier than removing favourites; consider vegetables high in protein. Do you really want to know what happens at the Chiropractic coalface? What do Chiropractors actually do? What conditions do they treat, and how? Then walk with me through my seven years working in the polders of Holland. Another view of a different and very lovely people. It's a fun read; in the process you'll also learn more about ankle joint pain. I learned a lot about ankle joint pain in the Netherlands; their staircases are extremely dangerous with many folk taking a serious tumble. I still find it incomprehensible that their architects are so focused on saving space that they ignore safety. If you don't have a Kindle, load the free app from Amazon onto your smartphone or tablet. I believe it will take longer, but just like photography has gone totally digital, so will the book, given time. The driving force ultimately will be price. Electronic books will be far cheaper and you can download them instantly. Give it a try. You could have Stones in my Clog on your tablet or smartphone in a jiffy. Just $2.99. Or, $12 for the paperback in a week's time if you live in the USA or South Africa. Stones in my Clog is my third book of Chiropractic anecdotes; available as an ebook on Amazon for a song.